Constitutional Carry without a permit or license is NOT universally legal in the U.S. Concealed Carry requirements are different and change very frequently, so check with your state or jurisdiction for updates and the status. It is an understatement, but important, to reinforce that there is considerable variation in state and territory laws about even carrying one concealed gun, let alone the number and characteristics of guns you can conceal carry for self-defense. As we know, there are still states and territories that, even with their concealed carry laws, do NOT issue them or make it very difficult to get one, solely at the discretion of local authorities. California and Delaware “May-Issue” permit or license to residents only and California does not recognize permit or license issued by other states. California law requires all handguns to be registered there and you must show proof that “good cause” exists beyond general self-defense to justify the concealed carry permit for the gun, based on a 2016 federal appeals court ruling. For “good cause” proof, applicants should set forth a set of circumstances that distinguish the applicant from other members of the general public and causes him or her to be placed in harm’s way. Simply writing “self-defense” or “personal protection” on an application does not provide the requisite proof of good cause,” per the San Diego County Sheriff’s Office 2018 website. See the details at California Concealed Carry “Good Cause” Requirement. Also, California has an approved and certified Department of Justice, Bureau of Firearms Certified Handgun Models List, just like in Massachusetts, which is updated every year with changing certifications. Many handguns have been De-Certified and eliminated since the Models List has existed. Recently this July, I saw that 1,281 handguns had been De-Certified and learned a new De-Certification List would be released in January 2019. Note that California also has a requirement for 2 “microstamps” to be imprinted on a spent cartridge by the gun’s unique action. The authorized handgun, caliber, model, and serial number are listed on the concealed carry license in California. You may purchase no more than one handgun in any 30-day period in California, and there is a 10-day waiting period before the firearm release. Prior to buying a handgun in California, the purchaser must present a Firearms Safety Certificate after passing a Firearms Safety and Laws Test administered by certified instructors, for one gun. Also, a Certificate of Eligibility may be required of certain individuals. New York operates on a “May-Issue” to residents-only policy at the local county level with issuances entirely up to the issuing officer, which can take 4-6 months or longer for approval. Only handguns listed on the license can be used, and all firearms must be registered with the State Police. A New York Pistol license is not valid in the five counties that make up New York City. The New York Pistol/Revolver License Application for Concealed Carry requires four character references who by their signature attest to the applicant’s moral character. The application has required spaces to indicate Pistol-Revolver, Manufacturer, Model, Caliber, Serial Number, and Property Of data. Constitutional Carry without a permit exists among a few states, e.g., Alaska, Arizona, and West Virginia, while Arizona as a Constitutional Carry state does issue permits. Confusing! Some jurisdictions impose strict limitations on concealed carry, like the number of handguns allowed to carry, specific type, and specific caliber of handguns (e.g., New Mexico, Texas, and Oklahoma.) Some restrict carry magazine capacity (New York, California & Massachusetts), and some restrict certain activities for carry (California, New Jersey, New York) on an approved concealed carry application. 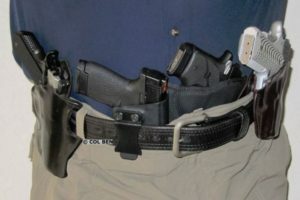 Is Concealed Carry Of More Than One Handgun A Crime? Yes, it can be in some places. The number of guns you can conceal carry is sometimes directly specified, and other times it is not. For example, New Mexico specifies that residents shall carry only ONE concealed handgun at any given time and the type of handgun (revolver or semi-auto) and caliber are specified on the license. Puerto Rico Concealed Carry law also limits the carrying of more than ONE handgun at a time. In Texas, you could be licensed to carry only revolvers or both revolvers and semi-auto pistols, but you have to carry only the type specified on your license. So, you could be breaking the law if you carry more than one handgun or a different gun with your concealed carry license or permit in some jurisdictions and states. This is frequently changing, and the rule of law varies significantly among states and territories. And there is no federal statutory law concerning the issuance of concealed carry licenses or permits. There is not a universal state or federal law, rule, or guideline to follow that will keep you out of hot water in all states and territories. Constitutional Carry is not the law at this time in all 50 states and territories. So, Should You Carry A Back Up Gun (Bug)? There are very extreme views and responses to this question and some pros and cons to consider. Some think carrying two handguns (a primary gun and a spare backup gun- BUG), and a spare magazine or two make perfect and logical sense for self-defense. 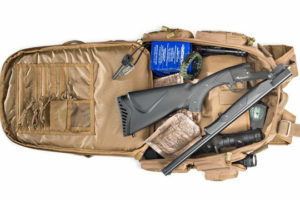 Others believe just the opposite and that it is ludicrous, downright dumb, and against the law of probability for deadly-force encounters to carry this extra weight and equipment for low-probability encounters. After all, you are already weighted down and carrying your primary gun, holster, mag pouch with extra ammo, knife, tactical flashlight, wallet, keys, cell phone, etc. You don’t even have enough pockets for everything, most pockets are small in size, and off-body carry is risky. They mention the 3-3-3 Self-Defense Rule for Deadly-Force encounters that says most attacks occur at 3 YARDS or less, in 3 SECONDS, and only 3 ROUNDS are fired, and it’s over. This is loosely based on law enforcement statistics in the FBI’s Uniform Crime Reports for law enforcement shootings, but I have no other evidence for civilian encounters. A few folks rationalize that they cannot ever think of a single incident where a civilian who legally is carrying a weapon has ever needed to fire more than the usual three rounds or so in an encounter with a Bad Guy-Gal, let alone needing to carry a couple of handguns, their holsters, and much more ammo, etc. Of course, most of us can think of situations involving multiple attackers and needing a couple of magazines and maybe 20 rounds total or so. And you could have a malfunction or mechanical problem with your handgun. But, are these rare, infrequent, and unusual situations? Several dedicated and licensed/permitted carriers, law enforcement, and security professionals, and well-intentioned self-defense citizens regularly and lawfully carry DAILY for 10 hours or so both a primary handgun and a Backup Gun (BUG.) Some even carry three handguns, pepper spray, a baton, taser, handcuffs, radio, an additional defensive knife, etc. But, remember there is a difference between law enforcement and civilian carry.